Burton D. Morgan Foundation champions the entrepreneurial spirit, contributes to a robust entrepreneurial ecosystem, and serves as a leader in the field of entrepreneurship education. It’s rare for even the most visionary people to continue to exercise influence on the world years after their passing. But then, Burt Morgan was exceptional. He not only saw the future; he helped shape it. It has been over 50 years since Burt established Burton D. Morgan Foundation. It was a modest enterprise at first, but one with large ambitions. Perhaps only he could have imagined how it would develop into what it is today. Our late founder graduated from Purdue University in 1938, in the midst of the Great Depression, when jobs were scarce and economic hope was in short supply. But the fledgling mechanical engineer went on to prosper in corporate America, before becoming a noted serial entrepreneur and informal business mentor to generations of his counterparts. And yet for all his success, in later life he came to regret that he had no formal entrepreneurship education. He wanted others to enjoy the same freedom and personal satisfaction he had experienced by pursuing the bold life path of an entrepreneur. In his memoirs, Burt noted “I like the idea that entrepreneurship, which is how I got to this point in my life, is to be treated as a genuine career at the universities and colleges in the United States.” Drawing upon our founder’s wishes, the Foundation’s many investments have helped to elevate the study of entrepreneurship, positioning Northeast Ohio as a leader in the innovation economy. 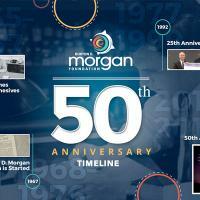 Please enjoy our interactive timeline, commemorating our 50th anniversary which we marked in 2017, honoring our founder, Burt Morgan, and capturing the history and evolution of the Foundation. The Foundation's mission fosters free enterprise through grantmaking, ecosystem building, and knowledge sharing. These efforts are built around the three priority areas of Youth Entrepreneurship, Collegiate Entrepreneurship, and Adult Entrepreneurship. Developing an economic venture or solution that adds value, embodies innovation and creativity, and involves risk to its initiators.